At RITE Academy we are thrilled that our Cultural Diversity Officer Wellness course for public service professionals has been accepted as the newest IADLEST National Certification Program™ for law enforcement. Knowing that our course passed this arduous process and that our RITE Course is now accepted by POST in 31 states is very exciting. RITE believes national certification for training is key to offering the finest education possible. 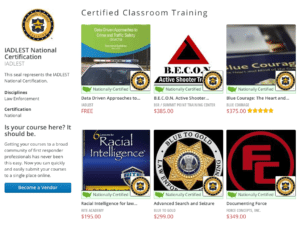 RITE Academy, let me be the first to congratulate you for achieving the IADLEST National Certification Training seal for your course: Racial Intelligence for law enforcement & public service professionals. Your course achieved “Best Practices” in many categories and it is a very impressive training course. 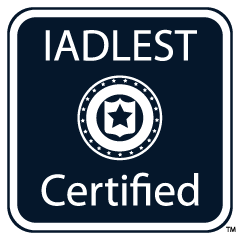 What is the IADLEST National Training Certification? IADLEST has created a revolutionary new program designed to eliminate many of problems associated with a lack of standardization within police training. The IADLEST National Certification Program (NCP) sets minimum standards for vendors providing police continuing education and ensures training content meets those quality standards. The standards are designed to meet or exceed any individual State certification requirements thus ensuring that IADLEST certified training will be accepted by all participating POST organizations in the Nation for training credit. The mission of IADLEST is to research, develop,and share information, ideas and innovations which assist states in establishing effective and defensible standards for employment and training of law enforcement officers, and, in those states where dual responsibility exists, correctional personnel. IADLEST is an association of standards and training managers and leaders. Its primary focus is criminal justice standards and training. To the extent that the focus and the values promoted thereby can be furthered and shared, all training professionals are welcome as members. IADLEST offers its members an opportunity to meet with other training and standards managers to exchange ideas, seek advice, and to compare progress. Members receive the products of IADLEST projects, national policy input, and innovations in criminal justice standards and training. The RITE Academy provides public service professionals with in-service training in Racial Intelligence. The RITE combination of Emotional Intelligence and Social Intelligence improves job performance, communication skills, and community trust.